treatment, the medicine she brought home. Not much about the vet himself until she mentioned “He came out of the back room with her file in his hand and asked: ‘Is her name actually Drama Queen? '” Then she goes back in the story to tell me he chastised her for saying “Drama Queen, you’re fine,” over and over. He told her if she’d ever been bit by a snake, she’d be in a lot of pain herself. Once he realized my friend was using Drama’s name, not mocking her, he felt a bit foolish. We laughed, and then I thought “That’s EXACTLY the kind of thing Paul would do!” Anyone who has read Teach Me To Forget would know Paul, Bethany’s commitment phobic veterinary friend who used her as a shield against the divorcees and single women in his practice. He thought of her as a buddy and never realized she could have been “the” woman for him. Once Jonathan and Bethany met, Paul became an also-ran. EXCERPT: Jonathan and Bethany have arrived at Paul’s clinic, and meet a stylish blond woman in the parking lot with her Doberman Pinschers. Then Paul comes out of the clinic door. “Gorgeous would be too meager a word to describe the man who emerged. Thick, sun-kissed golden hair framed a face of timeless Nordic beauty. Brilliant green eyes perused the grouping in the parking lot and some emotion, that might have been relief, came over his classic features. Shoving the papers he held into the pocket of his white lab coat, he rushed forward. rest of the people, shielding his love from the world. “Are you sure you don’t want to rest for a while, kiddo?” Paul’s voice was muffled as he reached beyond sacks of dog food. “You know how I am when I’m traveling. If I stop now, I won’t get my body moving for days. I’ll be fine. Give me that.” She reached for the bag he had dragged forward. Paul peered closely at her. No doubt he was comparing her standard casual appearance to Merritt’s unconscious elegance. Bethany had always known Paul appreciated her more for her friendship than her looks. Then her friend smiled, suddenly and rather wickedly. 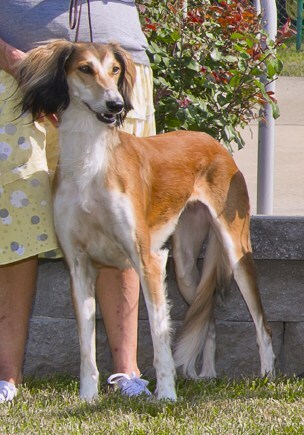 Yep, Paul would definitely chastise someone for calling their Saluki a Drama Queen when that’s actually the dog’s name. Now is the owner of the Saluki going to be the woman who convinces Paul to give up his casual ways? Hmmm, a Saluki in one of my books, what a concept!